Storyteller is a monthly digital collection created by Just Jaimee. It is packed full to the rim each month and includes 100+ kit elements, 30+ word art, 30+ digital papers, 40 Pocket / Project Life style Cards in various sizes alphas and more! How does the Storyteller Subscription work? The monthly collection is released the last friday of each month. If you subscribe to my newsletter, you will get an email to let you know the new collection is ready to be picked up and downloaded. Other wise, you could look out for the TLP Newsletter, the Storyteller Forum and all of my social media outlets to remind you to grab Storyteller. What can I expect to receive in the monthly Storyteller collection? No. You do not have to subscribe, however, subscribers DO get the collection at a far better price than purchasing individually. If you subscribe to the Just Jaimee newsletter you will get the best price for the monthly subscription. Sign up below! I also offer my newsletter readers a special price for the monthly storyteller collections who choose not to subscribe! 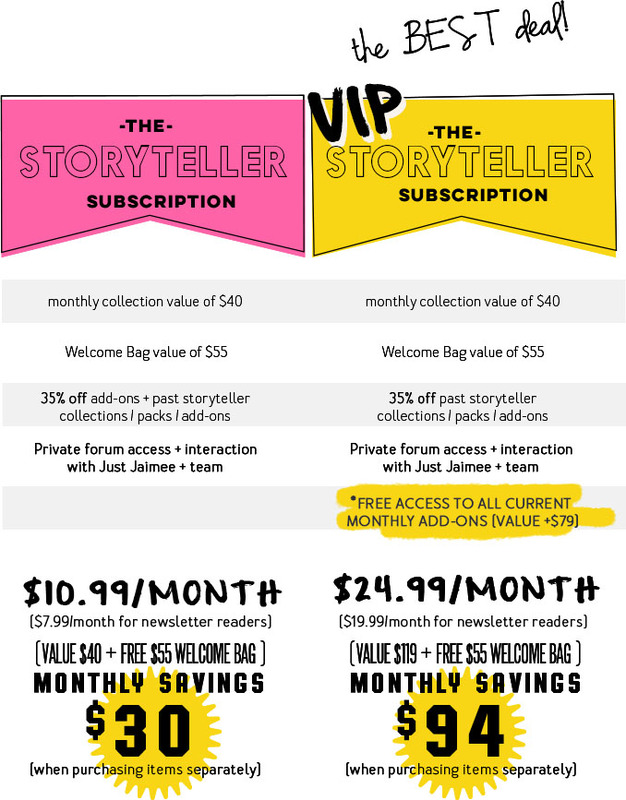 Save $3/month on the Storyteller Subscription! 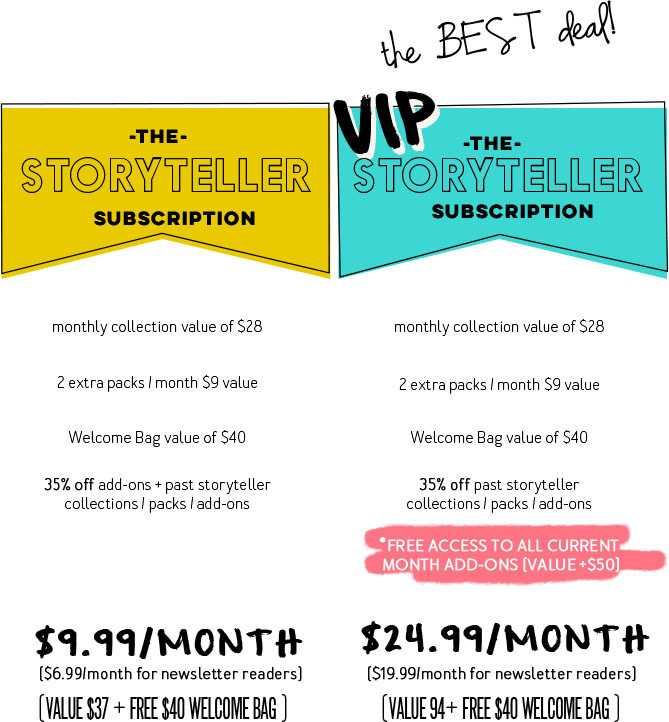 Subscribe today for a discount of the monthly storyteller subscription and also get the latests tips, tutorials, products, exclusive discounts and the occassional freebie. What is the difference between the regular subscription and the VIP subscription? I would like to upgrade my subscription to the VIP subscription, how do I do that? Please contact TLP customer service if you have any issues. What kind of add-ons will be offered every month? So if you are a VIP subscriber, you'll get a brand new product every Wednesday + Friday (with the exception of the first friday of the month which is BYOC at TLP) for the first 3 weeks of the month! It's a great value! Regular subscribers still receive 35% off add-ons (not combined with release sale price) and Wednesday releases are 50% off for 24 hours! When will the monthly payments come out? Your payments will come out of your paypal account automatically every month on the day you subscribed. We will be moving our subscriptions to an improved subscription platform, which will change the payment schedule to the day before the the scheduled release. We will be sending out an email to let you know when we have changed the system so you know. I need to cancel my subscription - what should I do? Please contact TLP customer service for further instructions. When we move to the new subscription platform, you will be able to do this directly from your account. Please keep in mind that lump sum payments will not be refunded. Do you have any tutorials on how to use Storyteller? Yes! We will continually be adding tutorials and tips for using Storyteller throughout the year. Be sure to subscribe to the Newsletter in order to get the latest news. Join the Just jaimee newsletter! I would love to make a suggestion - where do I do that? I would love to hear your suggestion! Please fill out the suggestion box form here. I have a problem / question - who do I contact? If you have an issue / problem / question about the Storyteller Collection please contact Jaimee directly.